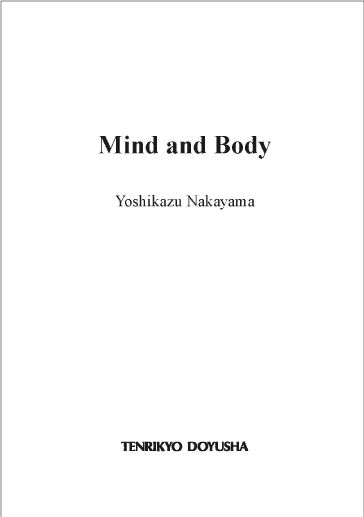 A booklet entitled Mind and Body—published earlier this month by Tenrikyo Doyusha Publishing Company—presents a revised English translation of Kashimono Karimono, which was originally written in Japanese by Yoshikazu Nakayama and published in 1975 by Tenrikyo Doyusha. 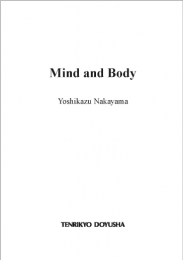 One of the most important teachings of Tenrikyo is that of “a thing lent, a thing borrowed.” This teaching tells us that the human body is a thing lent to us by God, a thing borrowed. . . .
To most people, the feeling that their bodies are their own—or that they are the bodies—is so natural and au­tomatic that it never occurs to them to question wheth­er this feeling is accurate. Yet we are taught that the body . . . is borrowed from God the Parent. We are given freedom in how we let our minds work. The workings of our minds can . . . shape our feel­ings and emotions—including joy, anger, love, and hate, with countless dramas unfolding in our lives. . . . Although we boast about our abilities and achievements, it may turn out that we do not even have control over what we think is our own body. If we borrow it from God, we cannot use it freely unless allowed to do so by its Lender, as it were. Moreover, the time will come when we have to return it to the Lender. Contrary to the popular belief that we live by our own power—by using our body and mind as we like—not only were we created by God but we are enabled by God’s providence to be alive, according to Tenrikyo. . . .